Plantronics AP15 VistaPlus digital headset amplifier delivering precision audio. 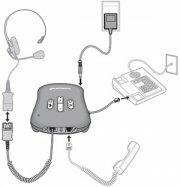 Plantronics VistaPlus AP15 is specially designed specially for loud and noisy call centers. The AP15 features multiband compression and DSP hardware that improve intelligibility by correcting for signal loss anywhere in the bandwidth. AudioIQ technology improves call accuracy by reducing background noise and keeping incoming calls at a consistent and comfortable listening level. Echo cancellation and noise reduction offer superior transmit sound. With its unique combination of audio-clarifying technologies, Plantronics AP15 helps boost contact center performance through improved agent productivity and customer satisfaction .